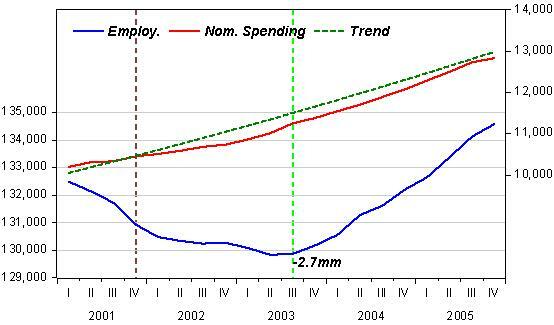 Why did unemployment rise so much in 1991 and 2001 despite NGDP in both cases maintaining a stable growth trend? One can debate whether the fall of NGDP was “significant” in 2001, because it looks as though the actual was about $300 billion below trend at the -2.7 million trough. But I don’t think there is a debate about the NGDP during the 1991 fall in unemployment. 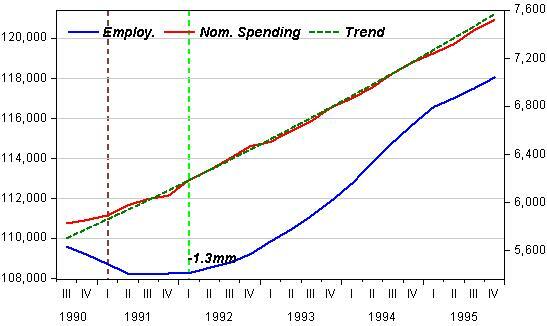 How can you know that monetary policy had nothing to do with the cause of unemployment in 1991? George, in 1991 the Fed was trying to bring the level of inflation down from a 4% average. It did so. It was called “opportunistic disinflation” by Orphanides.As Scott mentions in the comment section of his post, it´s quite likely the trend level of NGDP prevailing in the 1980s was higher than the trend that was established following the 1990/91 disinflation. That new trend remained in place all the way to 2007. The drop below trend in 2001-03 was very significant (giving rise to a lot of “deflation talk”). In the FOMC meeting of August 2003, “forward guidance” was applied for the first time. Bringing rates down to 1% had not changed anything, but forward guidance did the trick. 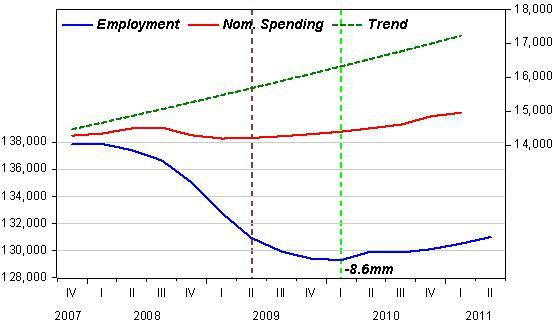 Spending began to rise back towards trend and employment ‘took off’, with unemployment coming all the way down to 4%.